"If this discussion could in any way lead to my being disciplined or terminated, or affect my personal working conditions, I respectfully request that my Union representative, officer, or steward be present at this meeting. Without Union representation, I choose not to answer questions. When management begins to ask you questions that could lead to you being disciplined, you don’t have to face it alone. If you have a reasonable belief that answers you give could be used by the supervisor to discipline you, the United States Supreme Court says you can refuse to answer any questions until a union representative is on the scene and has had a chance to talk things over with you first. It is your right to have the union representative present during the questioning to advise you, ask supervisors for clarifications, and provide additional information at the end of the session. The employee subject to the interview must reasonably believe that the investigatory interview will result in disciplinary action. A meeting called by the employer for the purpose of imposing discipline, is not an interview subject to Weingarten Rights. 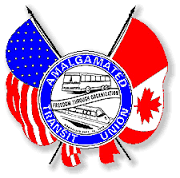 In another blow to Unifor’s anti-democratic raiding crusade, the legal challenge to the ATU Constitution and General Laws, filed by four ATU Local 113-Toronto, ON, members and funded in part by Unifor, came to a halt as an Ontario Judge ordered a stay of the litigation. The Judge held that that the plaintiffs had failed to first exhaust internal union processes to address their concerns before bringing their complaints to the court. “The Judge got it right. 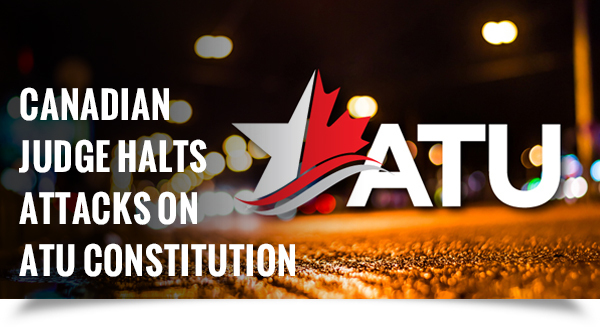 The ATU Constitution provides a mechanism by which members and locals can seek to amend the Constitution, and an ATU International Convention is the appropriate forum for any such debate,” said ATU International President Larry Hanley. “We make no secret of our disdain for the anti-union tactics of Unifor’s president. His Trump-style, anti-democratic campaign to build a border wall within the labour movement is hurting all unions and all working people.” Read more. In protest of the CARTA Board once again banning employees from testifying at the agency’s Board meeting, Local 1212-Chattanooga, TN, members walked out of a recent board meeting. The Local then held a press conference to highlight their concerns on the safety and reliability of the transit system - drivers being forced to work overtime beyond their physical limits, discrimination by management, and unsafe vehicles on the road. “This is flat out censorship. They are violating our First Amendment rights in an attempt to silence their workers for informing the riders about the dangerous and life threatening conditions on the system,” says Local President Kathryn Smith. "This is the hallmark of an out of touch, irresponsible bureaucracy that has turned inward, more concerned with themselves than the people they serve." Read more. JIC Councils chart strategy at meetings? Over the past few weeks, Locals from across the U.S. and Canada have held trainings to form the Joint Industry Councils at the Tommy Douglas Conference Center. The Locals who have contracts with multinational employers have elected council boards, passed by-laws and heard from experts and staff on the new realities of bargaining and campaigning against these large, deep-pocketed private companies. The training included negotiations strategies, how to build strength within our Locals, and planning for organizing campaigns. The Locals also exchanged ideas and experiences in dealing with these companies that will change our strategic approach to bargaining contracts. An ATU hero in Fresno, CA? Each day Fresno Area Express (FAX) bus driver Socorro Pelayo says a pray over each seat on her bus to keep her passengers safe before she starts her shift at 5:45am. The 30-year Local 1027-Fresno, CA, member credits the ritual with helping her save a 16-year-old female student from being assaulted at a bus stop. The incident began when a man started grabbing the young girl waiting alone for a bus. The girl screamed for help but no one came until Pelayo’s bus pulled up. The girl ran on the bus and Pelayo quickly closed the doors. Pelayo called the police and consoled the girl and the other riders on the bus who were upset. The girl’s mother called Pelayo “her guardian angel”, but Pelayo says “I don’t get scared.” Fresno Unified School District plans to publicly recognize Pelayo “for her heroism,” and the ATU salutes her too. Read more. Black History Month: Honoring Elizabeth Duff, Nashville’s first African American female bus driver? In recognition of Black History Month, ATU is remembering important people and events in the history of the civil rights movement and public transportation. This week we are honoring one of our own trailblazers – Local 1235-Nashville, TN, member Elizabeth Duff who became Nashville’s first African-American female bus driver in 1974. Remembering her first few days on the job, Duff says customers did not like the idea of a woman bus driver, but she used the hate and let it motivate her to do her best. To honor Duff the Local recently held a luncheon to recognize her more than 40 years of service for the MTA. Read more. BART employees report being kicked, punched, spat on, held hostage? Attacks on BART workers have doubled over the past few years. An investigation by KTVU Fox News found that from 2013 to 2017, there were 20 reported violent attacks against BART train operators, 174 reported attacks against station agents, and countless others - verbal abuse, spitting and other offenses - that go unreported. Many of the attacks come at the end of the line sweep to check the trains when drunk or sleeping passengers often don’t want to get off a train. Local 1555-Oakland, CA, President Gena Alexander says workers are like riders and just want to get home to their families safe and sound. The Local is calling on the agency to have more BART police officers at the end of the line as well as other solutions to prevent attacks. Read more. If you would like to download a PDF version of this ATU Dispatch please Click here.